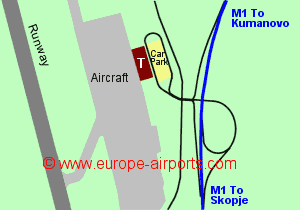 Find and compare the best prices from a range of well known car rental companies at Skopje Airport. This is a free to use facility, enabeling you to book direct with the company quoting the price. Prevously named Alexander the Great, a name which was dropped in 2018 to avoid confusion with Kavala airport in the Macedonia region of Greece, also named Alexander the Great. The airport has a modern terminal building, opened in 2011. 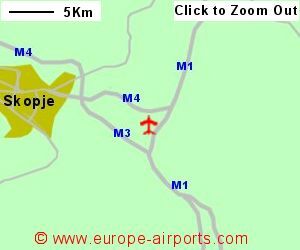 A bus service links Skopje airport with Skopje city at a cost of 150 Dinars (2.50 Pounds). Train services from Skopje main railways station connect to other cities and neighbouring countries. A bus route connecting Skopje airport to Prishtina in Kosovo began in August 2013, costing 10 Pounds. Taxis are available to and from the airport and are regulated. 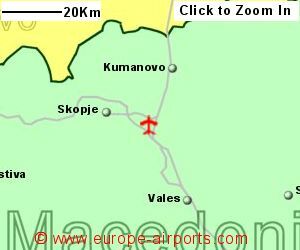 The taxi journey from the airport into Skopje should cost around 1200 Dinars (18 Pounds). The official Skopje airport website recommends that taxis are arranged by telephone instead of hailing one in the street. Skopje airport has 4 restaurants, 2 money exchanges, 2 cash machines, 2 shops, 2 VIP lounges, a business lounge, a conference room, a post office, and WiFi Internet access (free for 30 minutes). 1.8 million passengers passed through Skopje airport in 2017, a 13% increase on the previous year.